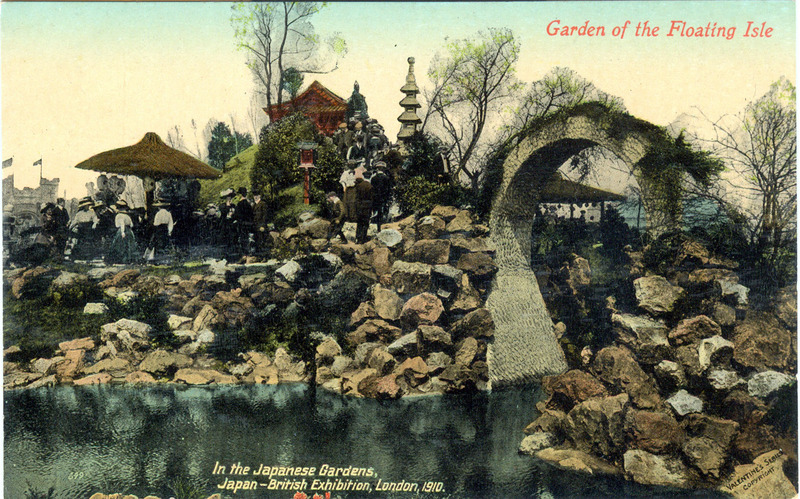 In the Japanese Gardens, Japan-British Exhibition, London (1910). 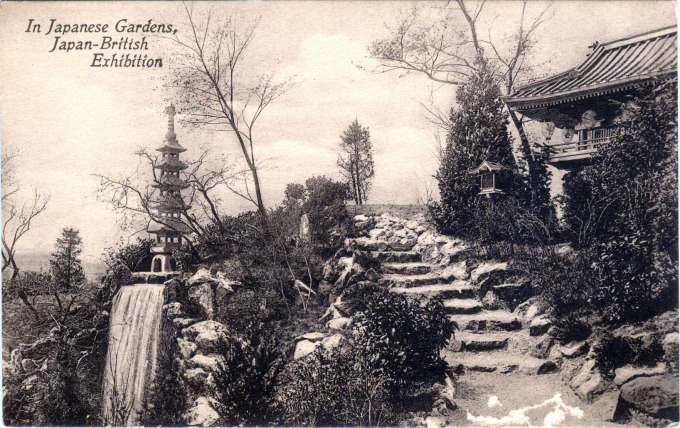 Garden of the Floating Isle, In the Japanese Gardens, Japan-British Exhibition, London, 1910. “[Writing in 1910:] With the concurrence of the Government authorities the Central Tea Association of Japan has decided to erect in the garden a true Japanese Tea House. The building is to be constructed in a most artistic style so as to enhance the typical atmosphere of the garden. 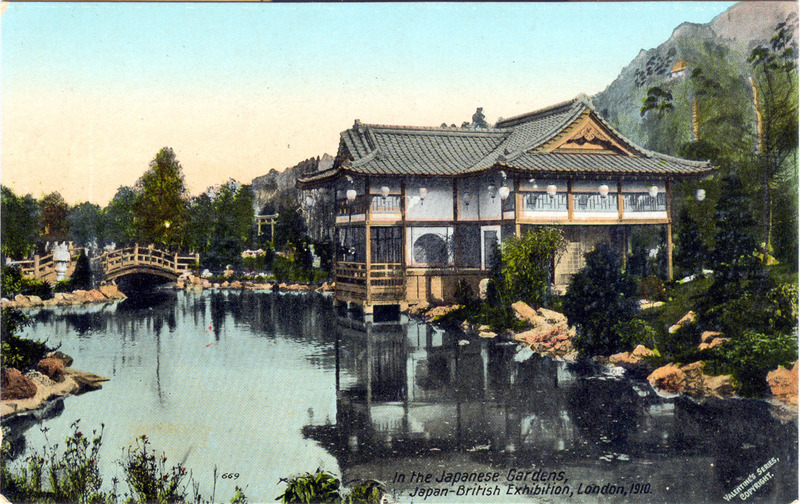 In another part of the grounds and on a more elaborate scale will be erected a Formosan Tea House where the famous Oolong tea will be delicately served to visitors, possibly by the natives – not by the savage tribesmen as aforementioned – but by fair maidens of that distant isle! In the Japanese Gardens, Japan-British Exhibition, London, 1910. Autumn, the Four Seasons, In the Japanese Gardens, Japan-British Exhibition, London, 1910. In the Japanese Gardens, Japan-British Exhibition, London,1910. 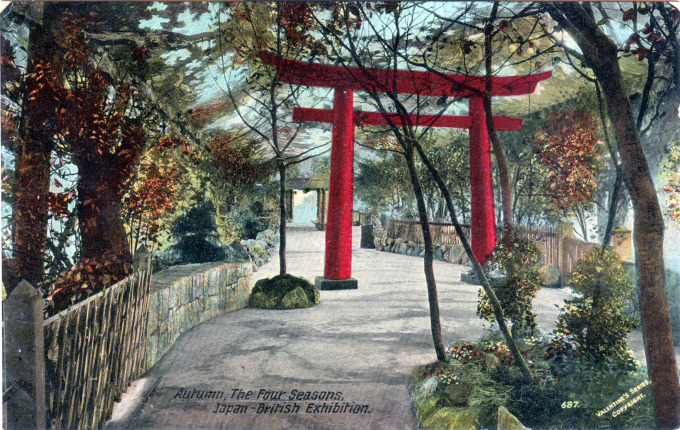 “Designed in Tokyo, the garden was brought into actual existence here by one of the most skillful and artistic of Nippon’s many artist-gardeners; and those who have been in the Far East and have felt, perhaps without understanding, the wonderful significance of such a scene, might well imagine themselves carried away over side oceans and resting once more in the heart of Romantic Japan.